You can now buy the best dedication boards from our company: Or-El. This is perfect for your local synagogue. We have been producing goods for synagogues for many years and more recently the quantity of merchandise that we have available has been maximised to suit the increased demands of our customers. If you are new to our website (http://www.or-el.co.il/len/), then please don't hesitate to search for all of the goods that will match what you are looking for! We sell the top of the range dedication boards, and now is the time to begin your search. Once you purchase one or more of these, you can either use it in a synagogue or even in a public ceremony: the choice is yours. What you should know is that you can get your hands on the highest quality synagogue merchandise with our assistance, no matter what the reason is for your interest. 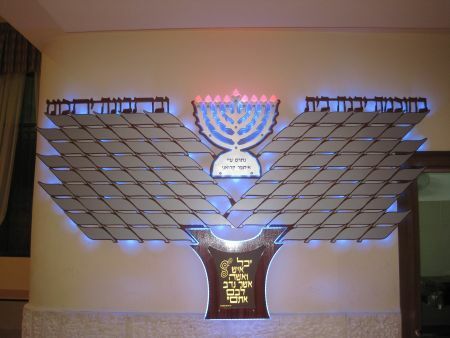 The advancements in technology in the past few years has allowed us to produce more attractive types of dedication boards that can be used for synagogues all over the world. Not only are they of the greatest quality, the safety standards we use are also very impressive. If you do want to get hold of special dedication boards from us at Or-El today, you should know that we sell these fitted with the safest LED lighting, making it a hazard free product for every purpose you desire. Moreover, Lighting used in all of our products has been switched from toxic mercury-laden fluorescent lighting to the smaller footprint and more environmentally friendly LED. LED lighting consumes less power, provides higher-intensity and better distributed lighting and heat as well as increased life expectancy. Whether you want to learn more about our dedication boards or are serious about buying one, you should know that there is so many that you can choose from at Or-El each and every day. This is something that you must never forget, especially as the need may arise that you'll want to buy from us a dedication board for your personal synagogue or for a public ceremony.